The first right hand drive Abarth 695 Tributo Ferrari to arrive in the UK took centre stage at a glittering motorsport celebration night recently at Abarth’s flagship dealer, Fiat Marylebone. The exclusive sports hatch – just 152 examples will be available in right hand drive form in Britain – features livery inspired by Ferrari’s models, with carbon wing mirrors and Corsa Grey wheels and front air intakes. 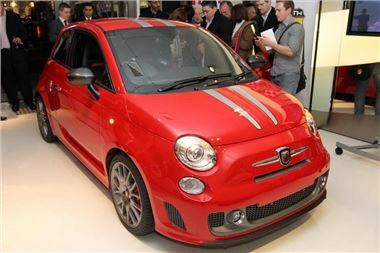 Fiat Marylebone, on London’s Wigmore Street, has already sold more than 20 Abarth 695 Tributos – two alone were ordered during the celebration night. The car featured alongside a host of other Abarth models including a Trofeo series race car, a stunning collection of classic Abarth racers and the more recent Abarth 500, 500C and Punto Evo cars. Guests, including actor Tom Chambers, comedian Patrick Kielty, Andrew Humberstone, managing director, Fiat Group Automobiles UK and Ireland, and Ivan Gibson, head of Abarth UK, also enjoyed a champagne reception, canapes, Scalextric model car racing and an interview session with Abarth racing driver Stefan Hodgetts. Powered by a 1368cc turbocharged engine, producing 180bhp at 5500rpm, the 695 Tributo can accelerate from 0-62mph in under seven seconds and has a top speed of 140mph. However, the frugal engine can return 43.3mpg on the combined cycle.